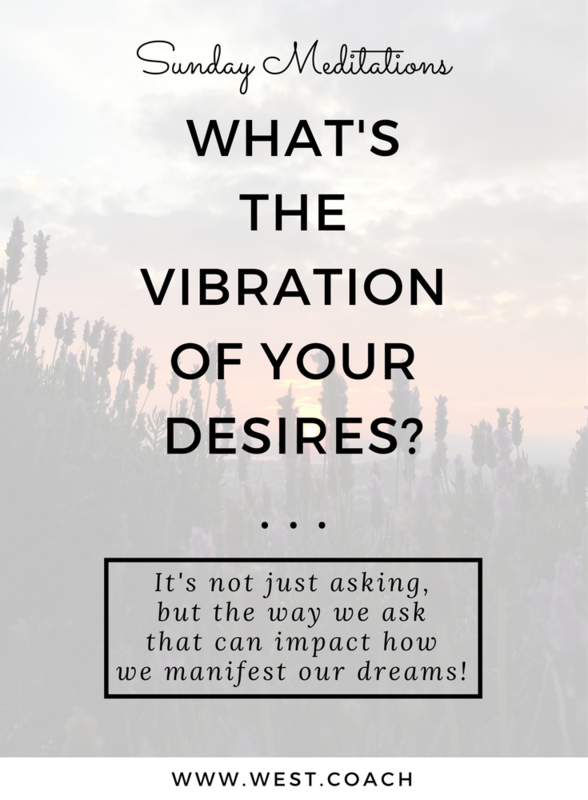 Sunday Meditations - What's the Vibration of Your Desires? I've been doing some content inventory over the last couple weeks, and realized that I've done two posts about ASKING! Thankfully even though they were kind of about the same thing, I didn't repeat myself - clearly there's a lot to be said on that topic! This week I'm writing about something that might look like asking on the surface, but it's actually a little different. Specifically, what energy we give our goals/dreams/desires - and how that impacts the way (or timeframe!) in which they are delivered to us. During my Life Coach Training program with Martha Beck - I distinctly remember a call where she discussed the different qualities we can give our desires. The way she described the first was putting our dreams out into the world with a "clingy, graspy, needy" feeling. Funny . . . I knew e-x-a-c-t-l-y what she was talking about! In contrast, the second method was to launch desires from a much deeper place - one of zen and calm and curiosity. Given that I didn't have a lot of experience asking in this way - I put the idea on a shelf somewhere in my brain and didn't give it much thought until the last few months when I've had a series of things show up in RECORD TIME after I've found myself thinking "Wouldn't it be great if . . ."
When I took a closer look, it was clear that those "asks" started from a state of wonder, rather than one of panic or neediness . . . they had a totally different vibration! One of my favorite books is called "Ask and It Is Given" by Esther and Jerry Hicks - which explores this idea of manifesting your dreams through the vibrations you put out to the world. "By the powerful Universal Law of Attraction, you draw to you the essence of whatever you are predominantly thinking about. So if you are predominantly thinking about the things that you desire, your life experience reflects those things. And, in the same way, if you are predominantly thinking about what you do not want, your life experience reflects those things." This summer I'd just about had it with the never-ending plucking of my eyebrows/lip/witchy chin hairs which seemed to have turned into a middle-aged reality. I literally found myself thinking - there HAS to be a better way! Followed immediately by the thought "I"ll call a waxing place this week . . ." But before I could get that organized, a friend of mine who is a Registered Nurse and now doing cosmetic procedures called me and said "Oh hey - can I practice Electrolysis on you?" Hello? YES PLEASE. Solution delivered - and unlike waxing, it's PERMANENT. Thank You Universe! More recently I found myself deeply disturbed by the presidential election - to the point where I was actually feeling quite anxious and couldn't really put my finger on WHY. I thought to myself "Wouldn't that be cool if I could sort out my Facebook permissions so that a certain presidential candidates' information just wouldn't show up in my feed?" Followed immediately by the thought "I'll ask my computer programmer boyfriend when I see him tonight - I'm sure he'll know how to do that." And then I forgot to ask him - oops! But when I got home that night there was something in a comment string on Facebook that was a link to a Google Chrome Plugin that would do EXACTLY WHAT I WANTED. And boy did I install that baby in a hurry! Neither of these desires were anything that I really cared about THAT much. I was looking for a solution to something that was annoying me, it wasn't a life or death situation. That being said, it has made me think about some of my bigger dreams and goals (even the Wildly Improbable ones! ), and how I approach them - would I be getting a different outcome if I didn't feel so panicked about the ask? Needless to say I am going to start paying attention and make sure that when I state my desires, I am coming from a place of zen, and not "totally freaked out". If you know what I mean! What about you? Do you have any big goals or dreams that are sitting with the Universe? Do you remember the energy you attached to those when you put them out there originally? If you are feeling like the clock is ticking and those just aren't manifesting in a timely fashion - perhaps they need a fine-tuning . . . an energetic reset if you will? I'd love to hear - leave a comment or send me a note!